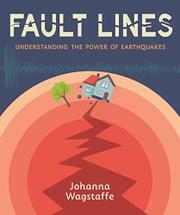 A seasoned meteorologist and journalist uses personal experiences, interviews with earthquake witnesses, history, charts, and photographs as she explains the science behind earthquakes. The introduction begins in a conversational tone that continues throughout a lengthy text: “When I was four years old, I lived with my family in Tokyo, Japan.” The author—shown, blonde and pale, in her kindergarten uniform—goes on to tell about the “regular earthquake drills” in her kindergarten class and the education that led her to become a meteorologist and science reporter. Five chapters follow, each with subheadings and a plethora of art to complement everything from discussions of the Earth’s layers through tsunamis to emergency preparedness. Most of the information is well-organized and logically sequenced; the only organizational glitch is that there are three occasions on which sidebars use such abbreviations as “M 9.0” to describe specific earthquakes before those abbreviations are clarified in an explanation of the Richter scale. The use of personal stories keeps interest high, and changes in color and typeface, as well as well-placed, colorful art, prevent fatigue. Vocabulary words are flagged in colored italics, and analogies and comparisons heighten clarity. There is even some humor, as in this heading about plate tectonics: “A Stressful Situation.” To help young people avoid sensory, personal, and intellectual overload, reading one chapter a day is optimal.